The waters around Patagonia are home to four types of whales: the orca, humpback, southern right and the blue whale. There are a number of dedicated whale watching cruises and boat trips that take you to special protected marine parks within the fjords and bays of Chile and Argentina, where you can get up close to these magnificent creatures and take some fantastic photos to remember them by. Appearance: These majestic creatures can be recognised by their huge flippers, which can reach a third of their total body length. They measure 11-19 metres and weight 25 - 35 tonnes, and are black in colour, with varying amounts of white on the undersides of their flippers and flukes. This can provide a useful aid in the recognition of specific individuals: one of our local partners can recognise most of the whales by their markings, and has even given them all names! Behaviour: humpbacks are known for their spectacular breaching displays and complex songs of 10-20 minutes, which are sometimes repeated for hours. The purpose of these songs are still not fully understood. They also have some diverse and fascinating feeding techniques, for example, teaming up together to trap fish inside a net of bubbles. Protection: humpbacks were targeted by whalers for many years, and hunted to the brink of extinction until the whaling ban of 1966. Our whale watching partners are conducting research to protect them from their latest threat: shipping. Migration: humpbacks typically migrate up to 25,000km each year, feeding in the summer in polar waters, and breeding/birthing during the winter in subtropical waters. The unusually rich feeding grounds of Francisco Coloane marine park in the Chilean fjords are so good that the humpbacks there have simply decided - 'why bother heading all the way down to Antarctica when I can just hang out here'! Appearance: These gentle giants are the biggest of all whale species, and the largest animal ever known to have existed. They are a mottled blue/grey in colour, and can reach up to 30 metres in length, and 180 tons in weight. They have long, slender bodies of varying shades, a prominent ridge running from the blowhole to the upper lip, and a very small dorsal fin. Behaviour: blue whales can be challenging to observe, as they only tend to reveal their small dorsal fins above the water, and can dive for long periods up to depths of over 500 metres. They tend to live alone, seldom forming close knit groups like other baleen whale species. Protection: blue whales were hunted almost to extinction until 1966, but are now increasing in numbers worldwide. Migration: Chilean scientists only recently discovered the sheltered, food-rich nursery area off Chiloe island where blue whales spend the southern summer (Jan - April). Appearance: southern right whales can be recognised by the callosities on their heads, their broad back without a dorsal fin, and their long, arching mouth that begins above their eye. They are dark grey in colour, with occasional white patches on their bellies. They reach up to 18m long and 90 tonnes in weight and are believed to have the largest testicles of any animal, each weighing around 500kg! Behaviour: they are very active on the water's surface, and curious towards boats, often engaging in a unique behaviour known as 'sailing', where they elevate their tail flukes to catch the wind. They often interact with other cetaceans such as humpbacks and dolphins, and have very strong maternal connections with locations and gene pools. Protection: the southern right whale is listed as 'endangered' and is protected by all countries with breeding populations. 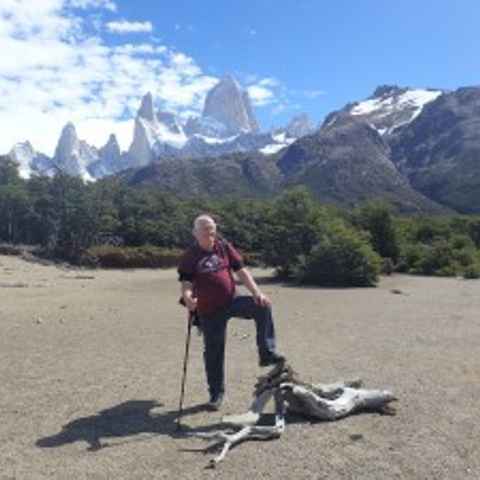 The Valdes region of Argentina hosts the largest breeding population, with over 2,000 individuals. Migration: they spend their summers in the Southern Ocean to feed, and migrate north in the winter to breed. They gather to shelter, mate, and rear young in the calm waters of Golfo Nuevo and Golfo San Jose of Peninsula Valdesfrom June - Dec, and you can also spot them from the beaches in Puerto Madryn and Playa Doradillo or by boat trip from Puerto Piramedes. Appearance: orcas are technically not whales at all - they are the largest member of the dolphin family, and can be recognised by their enormous dorsal fin, which can reach up to 2m high. They have a striking black and white pattern: white on the underside from throat to abdomen, with white oval patterns to the flank and behind the eye. They measure from 3-9m long and weigh 3-10 tonnes. Behaviour: orcas are very active at the surface, often seen breaching, and tail slapping. This can be part of courtship, communication, grooming or play. They also engage in 'spy-hopping' where they hold their heads above the water and observe their surroundings. In Argentina they are most known for beaching themselves in order to catch seal pups! Protection: there are several types of orca, and some are in more need of protection than others. Their biggest threat is depletion of prey, pollution, oil spills and habitat disturbance by humans/boats. Migration: orcas are found in all oceans and most seas but tend to prefer higher latitudes and coastal areas. They can be found around the coast of Peninsula Valdes in Argentina, and occasionally in the fjords of southern Chile. 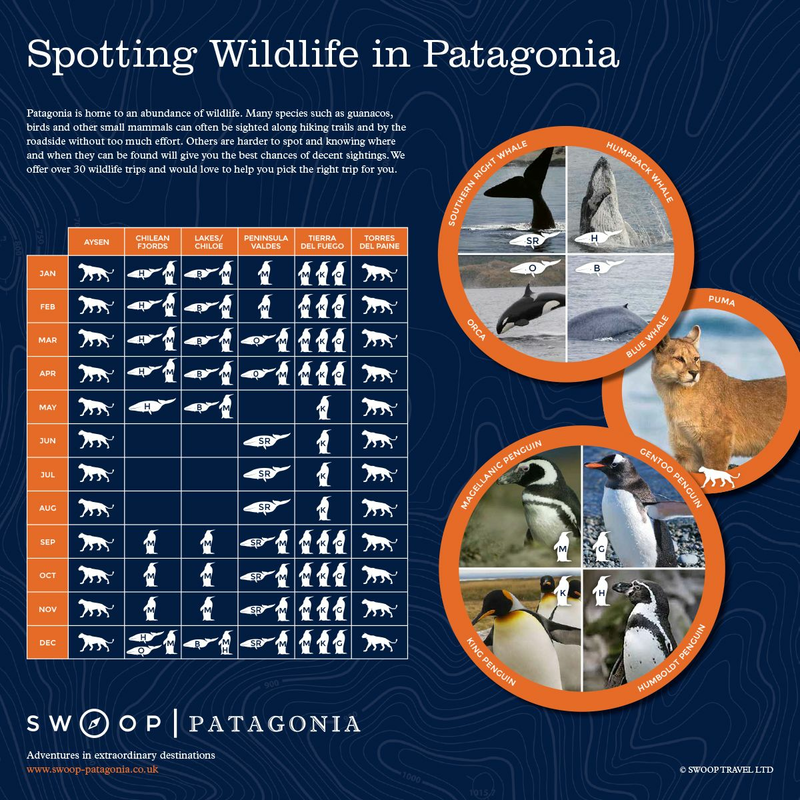 Where can I see whales in Patagonia? Whales can be spotted off the coasts of Chile and Argentina. For the best chance to see these magnificent creatures you need to follow their breeding and migration patterns. 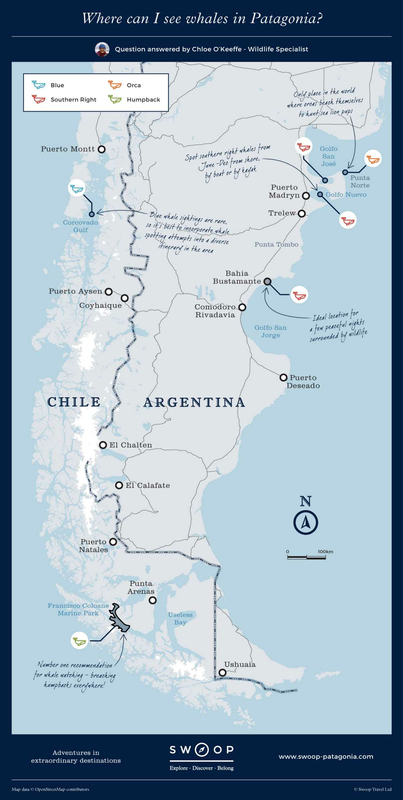 Humpback whales are present in a special corner of the Chilean fjords called Francisco Coloane marine park, which can only be accessed by boat from Punta Arenas. There are trips from 1-7 days long, aboard vessels of differing levels of comfort. Sightings are pretty much guaranteed, and most people experience numerous whales breathing and jumping around them, and generally see around 30-40 whales on a 3 day/2 night trip. Orcas are occasionally seen in these waters too, but this is more of a lucky sighting - keep your eyes peeled! Two types of whale can be spotted along the cost of the Valdes region of Argentina: southern right whales and orcas. Southern right whales are found in the calm waters of Golfo Nuevo and Golfo San Jose, where the calves learn to breathe and the adults mate. August, September, and October are the best months in which to see them, and sightings are pretty much guaranteed during these months. You can spot them from the beaches in Puerto Madryn and Playa Doradillo, or by boat trip from Puerto Piramedes. The orcas of Valdes are world famous because of their spectacular hunting technique. They are found along the coast of the peninsula all year long, but the beach attacks occur when sea lion pups are present. This is in Caleta Valdes and Punta Delgada in September, October and November, and Punta Norte in February, March and April. High tides generally increase the chances of attacks, and viewing is land based. The Corcovado Gulf lies south of Chiloe island archipelagic zone of southern Chile. Blue whales can be spotted here from January - April due to the food rich waters and shelter for feeding and nursing young. Blue whales here can only be spotted by boat, and they can be a challenge to find - you'll need some patience and sightings are not guaranteed. We offer one dedicated blue whale spotting trip that gives you the best chances of seeing these giants of the sea, but they can also be seen as part of more general wildlife cruises around the coast of Chiloe. For the best chances of seeing whales in large numbers, close proximity, and incredibly wild and picturesque surroundings, Francisco Coloane marine park is definitely the place to go. The Whale Watching was incredible, we saw over 40 whales in just 3 days! I've been lucky enough to spot whales all around the globe, but being amongst dozens of humpbacks in Francisco Coloane marine park is by far the fondest and most unique of my whale encounters so far - it's a magical place and an unforgettable experience.